Next Thursday, September 27, 2018, the Interagency Autism Coordinating Committee will meet to discuss the health needs of autistic people. I submitted the public comment below, which will become part of the IACC official record (though without the links featured here). You never know what will help, so I hope some of these suggestions stick. First: My thanks to you, the members of the IACC, for your work on behalf of autistic people of all ages and abilities. I am writing to you as the parent of a seventeen-year-old high support autistic son, whom I love with all my heart. (There is no “but” after that statement.) I am also writing to you as an advocate deeply engaged with autistic people, their families, autism professionals, and autism researchers, in my role as editor of Thinking Person's Guide to Autism. I am certain the Committee is aware that autistic people as a community are badly served by the current state of health care and supports. Both formal research, and autistic people's own reports, clearly show that autistic health concerns—including mental health issues—are too often dismissed or misunderstood, and that autistic people are also more likely than the general population to have co-occurring health conditions. I have to believe that the Committee shares my opinion that it is unconscionable for our autistic community members to receive improper and insufficient health care. I have to believe that you recognize why the current approach is also financially irresponsible, as the proactive and appropriate health care autistic and disabled people currently aren't getting is demonstrably more cost-effective than the reactive or emergency care they tend to get instead. Based on both my personal and professional experience, I have some recommendations on how to improve health care matters for autistic people. If nothing else, I would like to see more autistic-informed health care policy. It is only through participatory autism research that we have become aware of matters like the crisis-level rates of suicide and suicidal ideation in autistic people, while studies of commonly self-reported but poorly studied and understood co-occurring conditions like hypermobility or Ehlers-Danlos syndrome are only now emerging. If we are going to properly support autistic people of all abilities to achieve best possible health outcomes, our health care initiatives need autistic guidance. I would like to see more of this autistic-informed policy integrated into autism education for medical professionals, for matters like accommodations during patient-professional interactions. We need more medical personnel to understand why autistic people—even those technically capable of holding a conversation—can have a debilitating fear of needles, may have difficulty with sensory-intensive procedures like MRIs or EEGs, may have trouble answering questions or self-reporting accurately due to processing, alexithymia, or interception issues, and may have meltdowns when overwhelmed. We must develop strategies for ensuring those autistic individuals are accommodated, so they can receive the care they deserve without being written off as "difficult." I would like to see more medical professional awareness about the sensory needs of autistic people both in general, and in medical environments. When my son was recently in the ER at Stanford University, he was given access to a lovely sensory “Imagination Station,” and in addition the flickering fluorescent lights in his room were turned off. 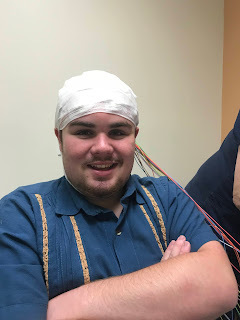 Many autistic adults who heard about my son's experience reported that they too would like access to these kinds of sensory accommodations, but such options, even when available, are usually reserved for children. I would like to see investment in “health passports,” like those developed by the UK’s National Autistic Society, to improve autistic people’s hospital and medical experiences. I would like to see encouragement to adopt and support models like the autism and healthcare toolkits and resources developed by AASPIRE and UCSF’s Office of Developmental Primary Care, in delineating compassionate, respectful, and useful best practices for patients with developmental disabilities. I would like to see all autistic people, including those with intellectual disabilities, treated with more respect by medical professionals. Autistic people must to be able to trust the professionals taking care of them if they are to tolerate anxiety-provoking medical environments—yet too often autistic people are not even addressed during in-person conversations about their own health, or they are spoken in a manner more appropriate for speaking to A Very Good Dog (as happened to my son while getting his flu shot just this week). In worst-case scenarios, dismissive attitudes can lead to tragedy, as with the recent death of 18-year-old Oliver McGowan. These attitudes must change, because my son's life and those of his autistic community members are valuable, and should be treated that way. I would like to see more awareness in medical professionals (and documentation in research) about autistic people's increased likelihood of atypical or paradoxical reactions to medication. I have learned about this tendency from autistic community self-reports as well as specialists like Dr. Glenn Elliott at Children’s Health Council in Palo Alto, and have also observed it first-hand many times with my son—including an ER visit in which he was given a medication that was supposed to stop his grand mal seizure, but instead sent it into overdrive. Yet not one medical professional who has prescribed medications to my son has ever ever mentioned such reactions to me, not unless I bring the topic up—and even then, many were not aware that atypical or paradoxical medication reactions are "a thing" for autistic people. I would like to see more outreach from medical professionals to autistic individuals and families about the side effects and unpredictable outcomes of routinely prescribed FDA-approved antipsychotic medications like Risperdal, which can cause liver damage, diabetes, and unavoidable weight gain—and the lifestyle changes people can make to at least partially offset those effects. I would like to see outreach campaigns about the ongoing (and illegal) use of medications as chemical restraints for people with behavioral difficulties. I would instead like to see more medical professionals helping families to understand how health, sensory, processing, and communication difficulties may be underlying the “unmanageable” aggression, and that in many cases accommodations and health care, rather than (or in addition to) medications, are what is needed. I would really like to see more emphasis on why co-occurring health conditions like GI troubles or epilepsy are not caused by autism, and why treating those conditions is not the same as “treating” autism. I would like to see the IACC take a firmer stance on pseudoscience medical approaches to autism, as these approaches dupe autistic people and their families into pursing expensive, bogus "cures," diverting both funds and focus from legitimate approaches to optimal autistic health and wellness. The organization TACA (Talking About Curing Autism) is holding its annual conference in California next month, and is featuring autism “health” seminars on topics that have not only been debunked by mainstream science, but which encourage parents to subject their children to potentially dangerous treatments. Examples include “The Importance of Detoxification” and “The Relationship Between Heavy Metals, Parasites, and Symptoms in Your Child.” Yet somehow this conference is eligible for Regional Center (Medi-Cal) reimbursement. This is a waste or both private and public funds, especially for families or individuals with limited access to resources. Finally, I would like to see recognition that health care access gaps are even more pronounced for autistic kids and adults who aren't male, autistic people of low socioeconomic status, and autistic people of color, due to well-documented barriers including accessing formal diagnosis, and thus receiving proper care and accommodations. We need investment in easy-read and multilingual autism and health care information. Ideally, we also need investment in "community ambassadors" who can translate and/or advocate for people who may have multiple barriers to resources, and thus to effective self- or family advocacy. I need the Committee to understand that while this list may seem excessive, it is in actuality neither comprehensive nor sufficient; I am hoping other comments and discussants will address my oversights. However, tackling these issues would be a welcome start to helping more autistic people lead the happiest and healthiest lives possible. Thank you for taking the lead on this. For the reasons you outline above, we have developed Still Point Medical. It is a family practice designed for autistic adults, replete with medical appreciation and understanding of associated issues as you have described above -- as well as multiple sensory accommodations. The practice is also owned and managed by an autistic adult. We believe Still Point is the first in our state to offer these services, and that fact alone, we feel, is something of a travesty. It is, though, through communication, agitation, speaking out, and generally making ourselves known that change will happen. So glad to hear about you!